This convenient, useful, multi-function tool is the perfect addition to your sewing room, and can be used on all of your Brother sewing, embroidery and combo machines and Brother embroidery frames. No more searching for dimes, no more struggling to get your fingers under the needle! 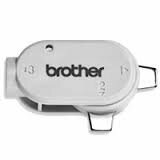 Works with all Brother sewing and embroidery machines and all Brother embroidery hoops and frames.